Starting from October 2, 2017, all visitors to the Palace Museum (often referred to as the Forbidden City) must book their tickets online. If you are a foreign traveler and don't know where or how to book the tickets, this article will be your guide! The official online ticket booking website is http://gugong.228.com.cn/. Unfortunately, the website has no English version. If you cannot read Chinese, you could try using Google Translate. We tested translating the page into English, and the translation is understandable. On the homepage of the official booking website (http://gugong.228.com.cn/), select the time (date and AM [entering before 12:00PM]/PM [entering after 12:00PM]) that you plan to visit the Forbidden City, then click “快速购买 (Quick Buy)" to proceed. There are three types of ticket to choose from: Adult, Senior, and Student. Select “港澳台身份证/护照 (Passport)", then fill in the passport number and the full name shown on the passport and click “添加 (Add)". Continue to add all of the members of your party. Once all the visitors are added, click “下一步 (Next)" to proceed. Please note: all of your party must check in together at the entrance of the Forbidden City or there is a chance that you won't be granted admission. The Treasure Gallery and the Hall of Clocks are two small museums inside the Forbidden City that require additional tickets. If you wish to visit either of them, please select accordingly. Otherwise, click "下一步(Next)" to proceed. For this step, you need provide a local mobile phone number and click " 获取短信验证码 (Obtain a Verification Code)". After receiving the message with the verification code, input the code and click “下一步 (Next)" to proceed (leave the invoice field blank unless you need an invoice). Either select Alipay or a local bank (internet banking) then click "网银支付 (Pay)”. You will be redirected to a separate page to complete the payment process. Once you have successfully paid, return back to the payment method page and click “已完成支付 (Payment Successful)." The booking process is now complete and you can click the order number to view the details of the order and take a screenshot for future reference. There are Taobao shops and other online shops that provide booking services. However, like the official booking website, they are all in Chinese and mainly serve Chinese tourists, so we will not go into details about this method. If you can read Chinese and have a local phone number and payment method, then these shops are a convenient choice. 1. All visitors listed above must check in together at the Forbidden City entrance. Otherwise, some guests may not be allowed to enter. 2. If any of the visitors is under 18 or above 60 years old, please tell us his/her age for possible price discount. Once we receive your booking request, we will send a Paypal invoice to the email address you provide and by which you can pay us either using credit card or your Paypal account. After the payment is done, we will book the tickets within two hours (during normal working time) and send you the booking results by email. 1. Tickets can only be booked online 10 days before the date of your visit. We suggest you book tickets at least one day before your visit. 2. There are usually fewer visitors in the afternoon. If a mistake on our part leads to an incorrect booking, we will rebook tickets for you free of charge or issue you a full refund. Visitors who have not bought tickets in advance have two ways to buy a ticket in person. Firstly, if you have Alipay (Zhifubao) on your mobile phone, you can use it to scan a QR code and buy tickets after you arrive at the Forbidden City. Secondly, you can go to the Comprehensive Service Window (综合服务窗口) to the east of the entrance of the Forbidden City and ask the staff to buy tickets on your behalf. However, please note that there is a risk that tickets will be sold out, as the Forbidden City limits daily visitors to 80,000. In addition, you may have to spend more time waiting in line. 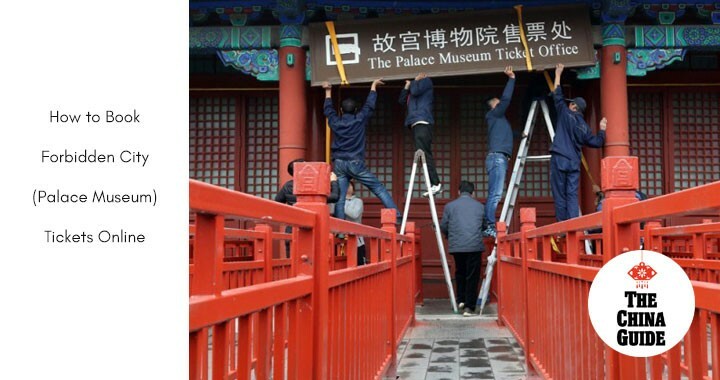 You don't need hard copy tickets to enter the Forbidden City. Once you have booked your tickets online, just show up with your passports on the date and time selected and scan them to check in directly at the entrance to the Forbidden City and its inside galleries. Be sure to check the map and read our tips before you go. Learn more about booking tickets to Mutianyu Great Wall, Badaling Great Wall, Jinshanling Great Wall or Terracotta Army.